You'll be £6.80 closer to your next £10.00 credit when you purchase The British Pacific Fleet. What's this? In August 1944 the British Pacific Fleet did not exist. Six months later it was strong enough to launch air attacks on Japanese territory, and by the end of the war it constituted the most powerful force in the history of the Royal Navy, fighting as professional equals alongside the US Navy in the thick of the action. How this was achieved by a nation nearing exhaustion after five years of conflict is a story of epic proportions in which ingenuity, diplomacy and dogged persistence all played a part. As much a political as a technical triumph, the BPF was uniquely complex in its make-up: its C-in-C was responsible to the Admiralty for the general direction of his Fleet; took operational orders from the American Admiral Nimitz; answered to the Government of Australia for the construction and maintenance of a vast base infrastructure, and to other Commonwealth Governments for the ships and men that formed his fully-integrated multi-national fleet. This ground-breaking work by David Hobbs describes the background, creation and expansion of the BPF from its first tentative strikes, through operations off the coast of Japan to its impact on the immediate postwar period, including the opinions of USN liaison officers attached to the British flagships. The book is the first to demonstrate the real scope and scale of the BPF's impressive achievement and this new affordable edition will be welcomed by all those who missed this major work first time around. While this will not be the final book on the British Pacific Fleet, David Hobbs has perhaps written the last word on the subject. I can’t see how it can be improved upon. The original manuscript would no doubt have been longer, but the entire thing has been seamlessly edited by someone who knows their stuff. The British Pacific Fleet is perfection. The cover tells a hundred stories at once, familiar and different at the same time, and sets up the reader for perhaps the greatest Royal Navy story of, at least, the twentieth century. It is a story that portrays the epitome of the wartime Royal Navy and Fleet Air Arm – determination to get the job done despite the odds. It is a tribute to the thousands of people who made it happen and who have largely been forgotten. The BPF is a subject written about on occasion, but needs an author with the right background to write the ultimate treatment. This is it. . .
. . . The author, a former naval aviator, is the leading authority on British naval aviation. Heavily illustrated and featuring a narrative that is as detailed as it is readable, this book is an immense achievement, just like the BPF, and the new paperback edition is the equal of the hardback! A magnificent and important book that should be on the shelves of anyone with a genuine interest in the history of the Royal Navy in the Second World War. It is usually hard when reviewing to resist the temptation to pick out a flaw or two, but if this book has any, they were far too inconsequential for me to notice them. Hobbs has produced a tome which finally does justice to the British Pacific Fleet, that contributed so much to the final battles of the war. 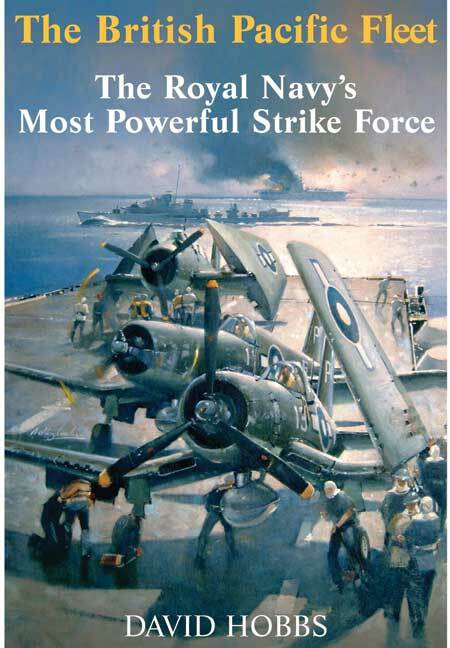 This thoroughly detailed and well researched book recounts the full story of the British carrier strike force in the Pacific Campaign in World War II. Very well illustrated with an impressive number of photographs inserted in to the text, this book is most strongly recommended. David Hobbs’s ‘The British Pacific Fleet: The Royal Navy’s Most Powerful Strike Force’ is a modern classic of naval history. It is a must read for Australian naval professionals and an important source for those interested in naval operations in the 21st century – one frequently labelled the Pacific Century. This was not intended to be the subject of my next review. When it arrived from the publisher I scanned it, looked at the photos, then settled down to read a chapter. I found I couldn't put it down. The subject is one I knew very little about and has not been covered well up until now. David Hobbs served in the RN for 30 years from the sixties, mainly flying from carriers. In the Ministry of Defence he was responsible for carrier operating techniques on the Invincible class. He is well qualified to write this book. Task Force that was sent to the Pacific at the ending of war in Europe. – Very Highly Recommended. Filling a serious gap in the history of the war against Japan, in this volume Hobbs, a former naval officer and historian (e.g., A Century of Carrier Aviation), addresses the role of the “British Pacific Fleet” in the last ten months of the war, hitherto a largely untold tale. An important book for any student of the war against Japan. The author has provided a very detailed history of the BPF, with good material both on the military operations of the fleet and the effort that went into creating and maintaining a fleet operating at a vast distance from its bases and that had far less time to develop its fleet train than the American fleet it was attempting to emulate. An impressive book looking at an impressive achievement. It is impossible to do full credit to this book in a brief review. The author, as a Royal Navy ‘insider’ occasionally shows himself to be in thrall to some of that service’s mythology. The book is well – produced on good quality paper, there are some useful maps (including some striking contemporary US Navy target maps), and the photographic illustration is remarkable. Fine new study, a gripping tale. David Hobbs' book is wonderfully well illustrated with photos from the author's private colection . The book is recommended without any reservation. It is one that will be of interest to both the naval historian and the general reader alike . An original and without doubt definitive account of the short history of the BPF. Profusely illustrated throughout, thoroughly researched and well-written, the British Pacific Fleet is an important addition to your library, both as a tool for research and as a historical text. Hobbs has made a number of strong political comments about how the RN had been allowed to run down before WWII and how many of the lessons from it were soon forgotten. He has defended these comments with extensive references to supporting documentation, reports, enquiries and patent historical fact. The narrative of this book is racy, absorbing and thoroughly researched. The index is exceptionally well detailed. This work is undoubtedly the definitive study to date and will be difficult to surpass. It is therefore strongly, indeed urgently, recommended reading for future planners as well as interested historians. The author deserves to be complimented on this fine study. A fitting tribute to the men who were part of the BPF. The book is not merely full of interesting facts, Hobbs has made the narrative gripping and awesome. The book contains so much information that a decent review would itself make a small booklet. The narrative of this book is racy, absorbing and thoroughly researched. The index is exceptionally well detailed. There are other publications detailing with the BPF but this work is undoubtedly the definitive study to date and will be difficult to surpass. It is therefore strongly, indeed urgently, recommended reading for future planners as well as interested historians. Profusely illustrated, with a great many interesting photographs and well-written captions throughout. A completely absorbing book. Without doubt 'The British Pacific Fleet' must be one of the best-written books on the complete campaign, from its early beginning right way through to the repatriation of PoWs and internees, the the fleet;s eventual demise. The author must be congratulated on producing a classic. Illustrated with interesting photos - including very rare action shots - it is a book which packs a lot in and does justice to the subject. This book can justifiably claim to be the first to demonstrate the real scope and scale of the BPF's impressive achievement. Those who like to read or to study Royal Navy carrier and fleet operations have had to wait a long time for what has every justification to be recognised as the definitive work on the operations of the BPF. The content whilst immense is highly readable. The immediate impression is detailed text, clear concise maps and a great number of photographs. The presentation is impressive, but so is the detail and the accurate research so recorded. It is a highly significant piece of intense research and highly recommended. This fine new study by CMDR (Retd) David Hobbs David Hobbs is a timely reminder of the scale of an exhausted Britain's achievement in mounting and supporting a fleet which for the last six months of he war was able to take its place in Halsey and Nimitz's fleet drive north to Yokohama Bay and final victory. The author provides a strategic focus which underlines the importance of what was achieved by the RN's carrier strikes against Sumatran oil refineries. David Hobbs tells a gipping tale of preparation for intense flying operations air combat, the destruction of Japanese aircraft and depots on the ground. He writes of the combat losses and those caused by error and accident. He described the survival at sea and rescue of pilots. Every mission and sortie and its outcomes are covered in detail. David Hobbs' book is wonderfully well illustrated with photos from the author's private collection. This book is recommended without any reservation. It is the most recent in a series of carefully researched and very readable books by David Hobbs. A well informed title with intriguing and unusual photographs.